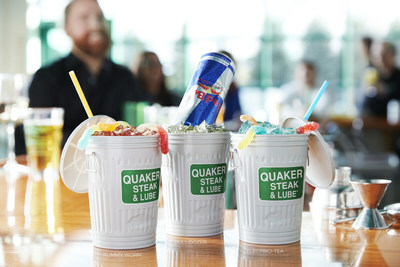 WESTLAKE, Ohio, April 12, 2019 /PRNewswire/ -- Quaker Steak & Lube, one of the nation's leading family casual-dining restaurant chains with franchise opportunities available, has rolled out a new limited time offer menu, featuring food and beverages that provide guests with fresh, new flavors that build upon the fan-favorite classics for which Quaker Steak is known. At the same time, Quaker Steak & Lube has revamped its all-day beverage menu focusing on quality spirits and trending drink categories. Just in time for patio season, Quaker Steak's limited-time menu features five new flavor-stacked steakburgers. 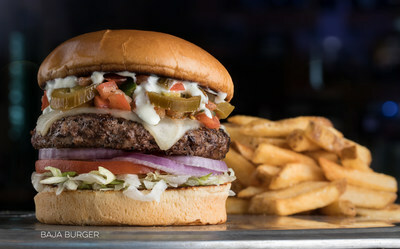 The line-up starts with a Baja Burger, topped with fresh and spicy south-of-the-border flavors. With continued international flair, the Reuben Burger — piled high with corned beef, Swiss cheese, crispy slaw and horseradish sauce, and the GTO Gyro Burger — topped with classic Greek beef and lamb, feta cheese and cool tzatziki sauce, will appeal to those with a heartier appetite. Rounding out the new burger features are the timeless Mushroom Swiss Burger and the savory BBQ O-String Burger. With seven USDA Choice ground steakburgers already offered on the all-day menu, the addition of these limited-time burgers presents guests with twelve burger builds to satisfy every taste and craving. Consumers with dietary restrictions or people simply trying to reduce their red meat intake can now substitute any traditional steakburger patty with the Beyond Meat burger. The Beyond Burger is a 100 percent plant-based option that contains more protein than beef, less saturated fat, no soy, gluten or GMOs, and is cholesterol free. It looks, cooks and tastes like a beef burger. Additionally, to accommodate gluten sensitivities, Quaker Steak & Lube offers a gluten-free bun option while also denoting gluten-free items across all of its food and beverage menus. "We are excited to introduce this wide variety of limited time burgers and give guests a dozen burger options to choose from for spring and summer dining," shared Bruce Lane, vice president. "With the addition of our Beyond Burger, all guests can choose a healthier option while still enjoying great tasting food." A variety of handcrafted, specialty cocktails complete the limited time menu. Cocktail drinkers will find libations crafted with trending new spirits like Aviation Gin. Owned by actor Ryan Reynolds, Aviation has a smooth, scaled back juniper base and is used in the Aviation Pineapple Sunrise. Jameson Caskmates IPA Whiskey finished in IPA craft beer barrels, enters the scene in the Blueberry Jameson Mule. With blueberries gaining position in the beverage industry, Quaker Steak has added the Tito's Blueberry Lemonade. The Leaded Strawberry Palmer offers a new twist to an all-time favorite. Guests will be amused by three new limited time "trash can" drinks. Served in a plastic mock trash can, the Electrici-tea is a new take on a long island iced tea and the Rummy Worm, crafted with Blue Chair Banana Rum, is kindred to a tropical rum punch. Both drinks are topped with gummy worms. The Bull-dozer trash can combines premium liquors and gets topped with an upside down can of Red Bull. Adding to the fun, guests can keep the plastic trash can cup and scan a Snapchat code to activate an augmented reality video. Quaker Steak & Lube's refreshed all-day bar menu further establishes the brand's beverage program as high quality and thoughtfully presented. Wine appears front and center in the menu, featuring new brands and expanded varietals resulting from guest feedback during 2018 beverage testing. Chloe, Josh Cellars, 19 Crimes and Prophecy brands have been added. Canned wine, a growing preference with younger guests, now comes in three varietals from Prophecy. Guests continue to look for all-natural ingredients, even in the liquor category. Quaker Steak & Lube is responding to the demand for 100 percent agave tequilas with the addition of Casamigos, a brand partially owned by actor George Clooney. The Casamigos 'Rita is Quaker Steak's ultimate top-shelf margarita. Other tequilas added to the brand's spirits category are also 100% agave. New drinks on the all-day bar menu include the Southern Hurricane, a twist on the Bourbon Street classic; the Blood Orange 'Rita, featuring the popular and intense raspberry-orange fruit flavor; the Jack Berry Smash; and two new mule drinks — the Tequila Mule and the Tennessee Mule. With continued growth in the mule category, Quaker Steak has strengthened its mule drink offering by featuring varieties made with bourbon, vodka, whiskey and tequila. Remaining on the beverage menu are many guest favorites, including tropical and frozen drinks, hand-crafted teas and lemonades, a variety of margaritas, and more. "The key to a successful beverage program is offering every guest a consistently made drink, each time," shared Shannon Salupo, corporate beverage manager. "With the new menu, we've rolled out a comprehensive bar training program to ensure our bartenders and servers understand the varieties of wine and spirits and are using the proper tools and techniques when mixing drinks." Quaker Steak & Lube's beverage line-up also features a wide variety of domestic, craft and import beers in cans, bottles and on tap. Quaker Steak & Lube's all-day and limited time offers pair perfectly with the brand's open-air bars and expansive patios for summer fun. The Quaker Steak & Lube® brand includes 43 locations in twelve states across the U.S. Quaker Steak & Lube restaurants combine unique décor, including gas station memorabilia, classic cars and motorcycles, with crave-able food and high-octane entertainment events. Quaker Steak & Lube has won hundreds of national and international awards for its food and more than 20 wing sauces. For more information about Quaker Steak & Lube, including franchise opportunities nationwide, please visit www.thelube.com or www.lubefranchising.com.